285 Clarendon (201 Beacon) is located on the SE corner of Beacon and Clarendon, with 180 Beacon to the North, 273-279 Clarendon to the South, across Alley 420, 199 Beacon to the east, and 278 Clarendon to the west, across Clarendon. 285 Clarendon (201 Beacon) was built ca. 1864 as the home of banker and stockbroker Thomas Handasyde Perkins, III, and his wife Elizabeth Jones (Chadwick) Perkins. They previously had lived at 17 Mt. Vernon and, before that, at 116 Beacon. As originally built, the entrance was on Beacon with the address of 201 Beacon. In 1915, it was remodeled and the entrance was moved to Clarendon, after which the house was given the address of 285 Clarendon. The land for 285 Clarendon (201 Beacon) was purchased from Francis E. Parker, a lawyer, on January 27, 1863, by Christopher C. Chadwick and William Warren Tucker, trustees of a trust established on July 9, 1855, to manage property inherited by Elizabeth (Chadwick) Perkins from her father, Ebenezer Chadwick, for her benefit and the benefit of her children. The lot was part of a larger parcel originally acquired from the Commonwealth of Massachusetts on May 2, 1860, by Norman Munson. Norman Munson and his partner, George Goss, were the contractors responsible for filling the Commonwealth’s Back Bay lands. Click here for an index to the deeds for 285 Clarendon (201 Beacon). Thomas and Elizabeth Perkins lived at 201 Beacon until about 1869. By 1870, they were living at the Parker House hotel, and by 1871 at 263 Clarendon. On August 30, 1869, 201 Beacon was purchased from Elizabeth Perkins’s trust by banker George Baty Blake. He and his wife, Ann Hull (Blake) Blake, made it their Boston home. They also maintained a home in Brookline, the former estate of Lewis Tappan, which they had bought in 1847 and previously had been their year-round residence. Ann Blake died in June of 1873. George Blake continued to live at 201 Beacon until his death in August of 1875. In his will, he left 201 Beacon to his two daughters, Elizabeth Cabot Blake and Anna Sophia Blake. 201 Beacon was not listed in the 1877 Blue Book. By the 1877-1878 winter season, it was the home of George and Ann Blake’s son-in law and daughter, Dr. David Hyslop Hayden and Elizabeth Cabot (Blake) Hayden. David Hayden was a physician. They had married in September of 1876 and 201 Beacon probably was their first home together. 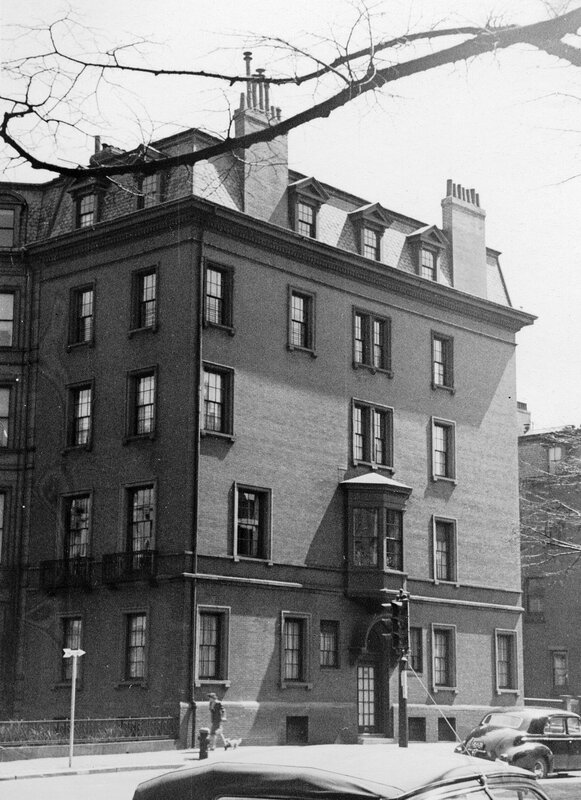 Prior to their marriage, Dr. Hayden had lived at 104 Marlborough. The Haydens continued to live at 201 Beacon during the 1883-1884 winter season, after which they moved to Newport. By the 1884-1885 winter season, 201 Beacon was the home of George Hignett Warren and his wife, Josephine Mary (Neilson) Warren. George Warren was a ship owner and shipping merchant in the firm of George Warren & Co., operators of steamships between Liverpool and Boston. His principal residence was Strawberry Field in Woolton, Lancashire, near Liverpool (the house later became a Salvation Army home for children, and was made famous by The Beatles in their song, “Strawberry Fields Forever”). The Warrens continued to live at 201 Beacon during the 1885-1886 winter season, but moved thereafter to 294 Beacon. By the 1886-1887 winter season, 201 Beacon was the home of George Baty Blake’s unmarried son, Stanton Blake. He was a retired banker, having headed the New York branch of his father’s firm. He continued to live at 201 Beacon until his death in April of 1889. On June 24, 1890, 201 Beacon was purchased from Elizabeth (Blake) Hayden and Anna Sophia Blake by Josephine Abbie (Ruggles) Harrington, the wife of Dr. Francis Bishop Harrington. He was a physician and surgeon, and also maintained his medical offices there. They previously had lived (and he had maintained his office) at 98 Charles. Francis Harrington died in June of 1914. Josephine Harrington and their daughter, Ruth, continued to live at 201 Beacon during the 1914-1915 winter season. By 1916, they had moved to 277 Clarendon. On June 14. 1915, 201 Beacon was acquired from Josephine Harrington by attorney John Loomer Hall. He and his wife, Dorothy Brinley (Morgan) Hall, lived at 339 Beacon. They also maintained a home in Manchester. 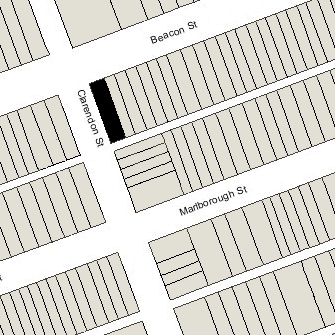 In July of 1915, John Hall applied for (and subsequently received) permission to move the entrance to Clarendon Street and remove the former entrance on Beacon, construct a rear addition, add an elevator, and make other interior alterations. The remodeling was designed by the firm of Parker, Thomas, and Rice. The Halls continued to live at 339 Beacon until the remodeling was completed. On November 21, 1919, John Hall transferred the property – renumbered 285 Clarendon — into his wife’s name. John Hall died in June of 1960. Dorothy Hall continued to live at 285 Clarendon until her death in April of 1961. On January 15, 1962, 285 Clarendon was acquired from the estate and heirs of Dorothy Hall by James Findley Newcomb, an organist, and his wife, Louise A. (Schmidt) Newcomb. They previously had lived at 5 Exeter. On July 20, 1962, 285 Clarendon was acquired from the Newcombs by Helen E. Larkin, a buyer with the Jordan, Marsh department store. She lived in an apartment at 195 Marlborough. In May of 1962, prior to taking title to the property, she applied for (and subsequently received) permission to convert it from a single-family dwelling into physicians’ offices. In August of 1962, she amended the permit to change the proposed occupancy to a physician’s office on the first floor and four apartments. She subsequently moved to one of the apartments. She continued to live there until the mid-1970s. On May 15, 1975, 285 Clarendon was acquired from Helen Larkin by Francis K. Tavares, Andrea N. Tavares, and Kenneth R. City. In June of 1975, they applied for (and subsequently received) permission to remodel the house into five apartments. 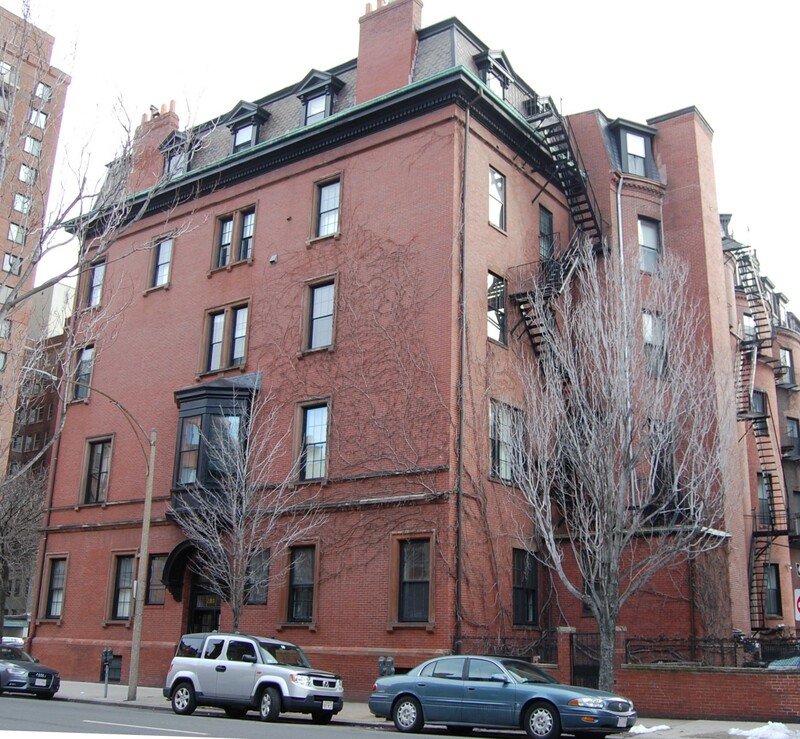 On May 9, 1988, they converted the property into five condominium units, the 285 Clarendon Condominium.